problems can lead to the development of mental health disorders. There is a high prevalence of diabetes co-occurring with mental health disorders. Sometimes it is the case that mental health issues are already present. Diabetes and mental health are very closely linked and it’s not always certain when one precedes the other. 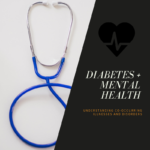 Despite the tie between diabetes and mental health being quite common, people with diabetes and other chronic illnesses are not frequently screened for mental health concerns like depression and anxiety. This can lead to them suffering for a long time by themselves needlessly, when they could be getting help to get them back on track both mentally and physically. Those with diabetes can often face something known as diabetes distress. Due to everything that has to be done on a day-to-day basis to maintain diabetes, it can be very discouraging to not see as much improvement despite putting in so much effort and adhering to all of the restrictions and maintenance that is required. When these feelings of distress take over and our efforts do not seem to be helping, one can slowly slip back into poor maintenance of their health and pick up unhealthy habits. Many people with diabetes suffer through diabetes distress even after several years of managing symptoms well. There are many ways for someone suffering from mental health disorders as a result of another chronic illness to find help. For diabetes sufferers specifically, it might be useful to visit an endocrinologist who specializes in the system of diabetes more specifically than a general practitioner. Your endocrinologist might have specific recommendations to help maintain good health and manage diabetes. There are also health psychologists who specifically focus on helping those facing distress from long term health problems that can help one through the mental struggles through therapy and by recommending diabetes support groups.